I could talk for days about Boba Fett, his popularity in modern culture, his mystique and his infamy, but my true passion for Boba Fett, as with so many things in Star Wars, is not so much the character of Boba Fett (after all, he was little more than a minor background figure with only seconds of screen time) but the care, attention and detail put into his design. In the entire original Star Wars trilogy, there is no other costume that is as detailed and complicated as Boba Fett. His helmet alone is a masterpiece, merging the aesthetic of ancient Corinthian hoplites with futuristic technology. The design provides an inspiring canvas and we were fortunate to have twenty amazing artists step up to take on the world’s most famous bounty hunter! I would love to talk about every one of our artists here, but instead I am only going to focus on three. 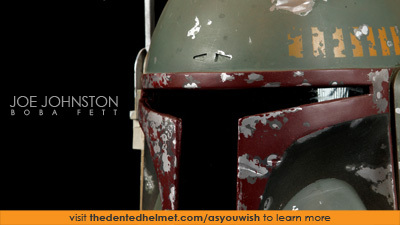 We are writing individuals articles for each artist and helmet at The Dented Helmet, which is also the site that donated all of the Boba Fett helmets and is overseeing this project. 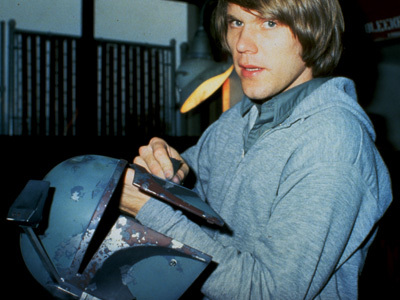 Joe Johnston, painting an original Boba Fett helmet in 1978. Many people know Joe Johnston and the late Ralph Mcquarrie were responsible for creating Boba Fett, with Ralph sketching some of the earliest designs, and Joe finalizing the concepts and being responsible for the look of the final costume. 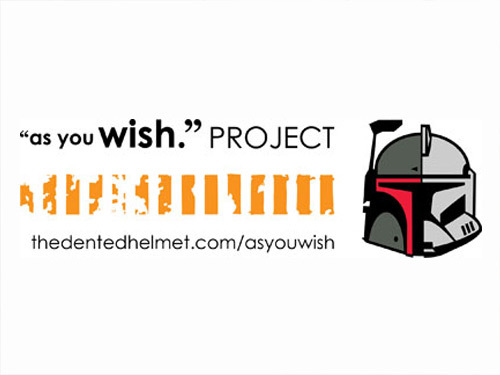 We were fortunate enough to bring Joe Johnston on board for this project, even though his schedule is incredibly busy, and have him paint up a helmet in support of Make-A-Wish! 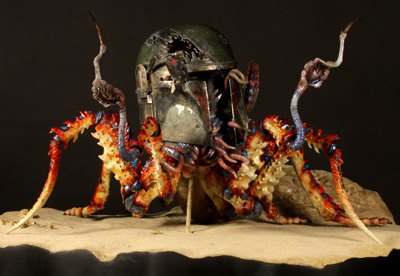 Upon first look at Joe’s offering for this project, one might think “well, that is just Boba Fett” until you realize it is Boba Fett painted by the same artist who painted the original! While some might consider this example overly dramatic, it is like Dali painting a personal copy of The Persistence of Memory just for you! What is most important about this piece is Joe’s painting technique which is often replicated, but has never been duplicated in 34 years! Joe’s style is all his own and is as unique as a signature! 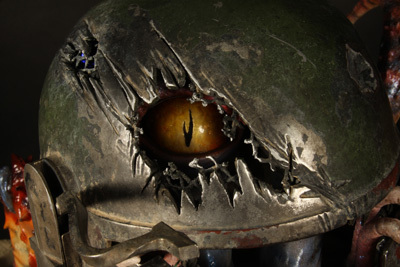 Boba Fett helmet painted by Joe Johnston in 2012. Sandy Dhuyvetter, working on original Boba Fett costumes in 1978. Most people know Joe Johnston, either through his work on Star Wars or his later work as a director of his own movies. In comparison, few people know Sandy Dhuyvetter’s relationship to Boba Fett, but her contributions to the iconic bounty hunter are just as significant and perhaps even more well-known! If Joe Johnston is Boba Fett’s “dad” (No Jango Fett jokes, please), then Sandy is surely “Momma Fett”. 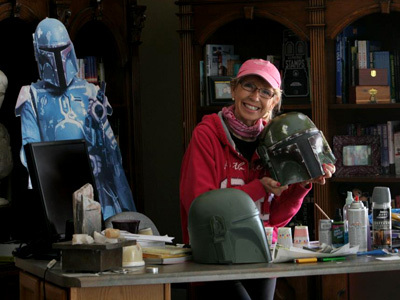 Sandy was responsible for painting 3 of the original 6 Boba Fett costumes, including the one seen on the original Kenner Boba Fett figure packaging as well as the Return of the Jedi Boba Fett helmet! Sandy was also responsible for adding a number of details to Boba Fett’s costume including Boba’s girth belt and wookiee braids! 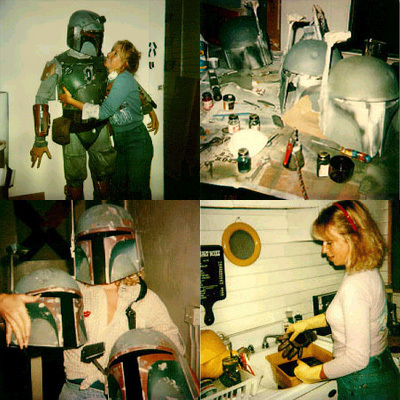 Sandy’s artwork for the As You Wish project is a reminder of her time with Boba Fett and includes a collage of photos from 1978 when she helped create an icon. Sandy Dhuyvetter with her helmet for the As You Wish Project. We approached a number of professional studios for the As You Wish Project. Many of them simply never responded, responded and told us they were too busy, or accepted and then had to back out because they became too busy due to the demanding schedule of the filming industry. When one such studio backed out we were left in a dilemma until Alan Scott and Legacy Effects stepped up to the plate to help us out. While most of our artists worked alone or in small groups, Legacy Effects (the group who helped bring to life Avatar, Terminator: Salvation, Iron Man and Reel Steel, just to name a few) brought its entire staff into this project and worked on their piece, titled “The Scavenger” as a company, incorporating almost every aspect of what their company does to create one of the most incredible pieces in this project! 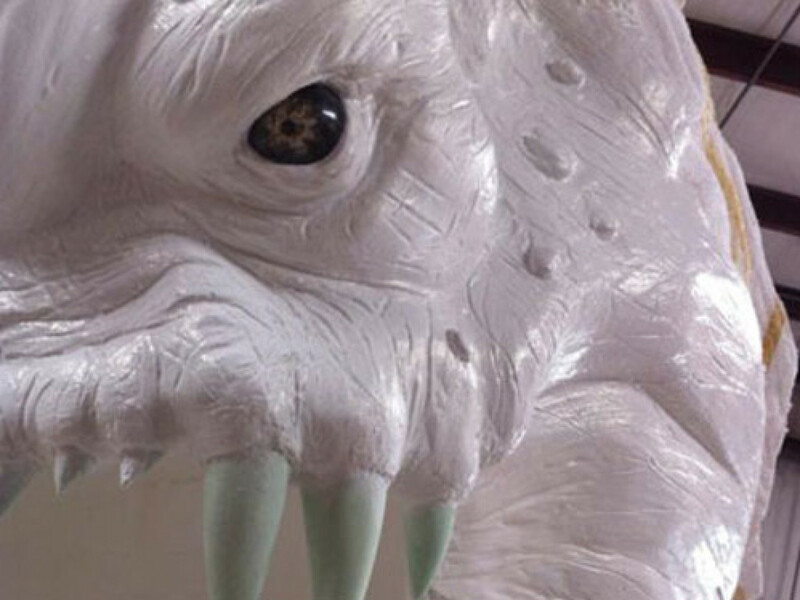 The scavenger is a completely custom creature from Legacy Effects, including silicone and fiberglass body parts as well as and animatronic body, eye and rangefinder stalk… yup, it moves! Best of all, Legacy really focused on even the most minor details, showing Boba Fett’s last minutes replayed over and over in the tiny rangefinder viewer. If you ever wanted a one-of-a-kind, custom piece, built by one of the biggest effects studios in Hollywood, this is likely your only chance to ever get it! 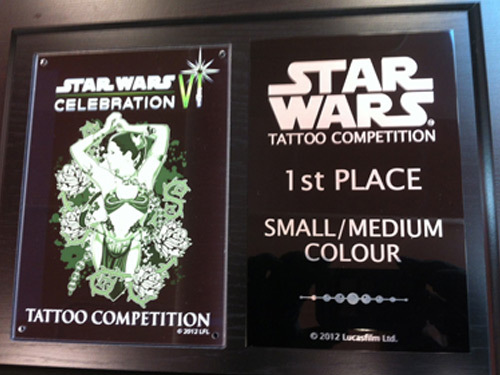 Looking forward to sharing our 3rd and final installment of the countdown to Star Wars: Celebration VI! Star Wars Celebration VI is coming to Orlando, Florida on August 23-26. Join the party that brings together fans of all ages to celebrate the pop culture phenomenon that is Star Wars.